Hand and Wrist Surgeon Site | Glenn D. Cohen, M.D. Dr. Cohen is the hand surgeon doctors and nurses trust with their own care. Read about the experiences of numerous health care professionals who have been patients, themselves. Read and watch 100's of testimonials from patients with conditions ranging from carpal tunnel syndrome to finger amputations. Dr. Cohen has been recognized for excellence by national and community organizations, as well as being a sought- after source by the media. Glenn D. Cohen, M.D. is certified by the American Board of Orthopaedic Surgeons. He is subspecialty trained and possesses a Subspecialty Certificate in Surgery of the Hand. 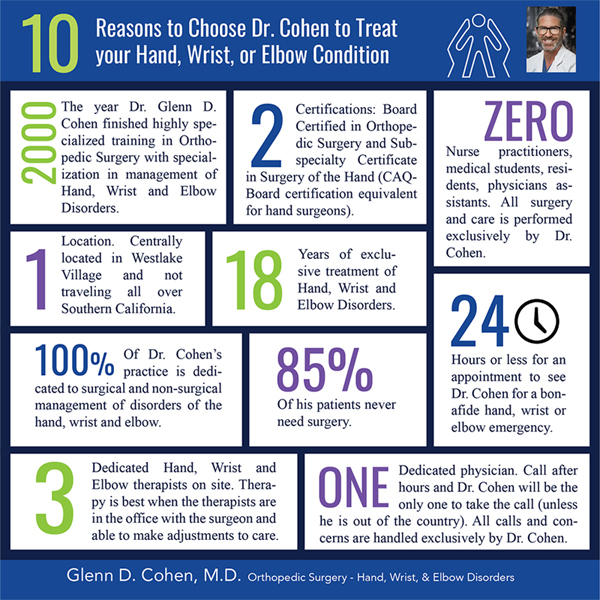 Dr. Cohen treats disorders of the hands, wrists, forearms and elbows. Not all problems require surgery. The majority of Dr. Cohen’s patients are managed with a course of splinting, therapy, injections and medications. Choosing the right hand surgeon can be a daunting process. Hand surgeons handle upper extremity problems from the fingertips to the elbow. Dr. Cohen is committed to quality care and excellent outcomes, and has outlined his personal commitment in "My Promise To You".